I have always had an affinity, and still do, for vegetarian/vegan cuisine. However, I have found that the best forms of this meatless realm are the ones tucked among the meat and seafood dishes, notably in Indian, Middle Eastern, and Asian restaurants. My experience has proven that vegetarian cuisine is very tricky in sustaining the interest of the diner, especially the omnivore, and that many exclusive vegetarian establishments don’t quite “get it”. But there is one place that has kept my taste buds curious with their offerings over the last few years. I paid the eatery my first visit many moons ago, and I left with a favorable impression by what I had that night. Due to the long distance from my former home to it, I did not return until my recent move closer, and this also made easier by the monthly meetings that I have to attend at a nearby school. 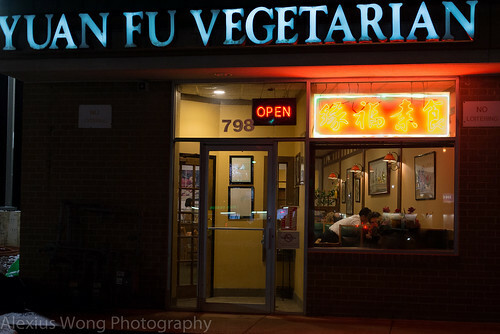 Yuan Fu Vegetarian Restaurant is located on the busy Rockville Pike in Rockville, MD, at the end of a 4-business strip mall that has been left unscathed by the rapid development around it – it is very easy to miss it especially due its location on the service road off the main road. Inside, the space is rather small without feeling cramped. The menu lists quite a number of appetizers and soups, and a few were sampled. 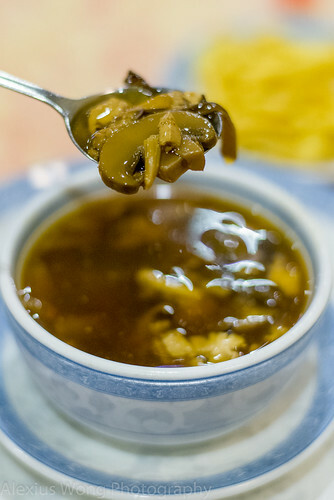 On a number of occasions, I started my meal with the Hot and Sour Soup. The first spoonful was a bit of a surprise but it said it all. I was expecting a good hit of vinegar but what I tasted was milder. As my tongue adjusted to the flavor levels of vinegar, salt, chili heat, and savory stock, I was appreciating the fine balance that did not steer my tongue too far in any direction. The bits of button mushroom, Shiitake mushroom, Chinese mushroom, wood fungus, bamboo shoot, and tofu pieces added the “meaty” body and different textures to this thick bowl. The side of crispy dough bits tasted fresh and nearly greaseless. For me, this rendition will put any of the meat versions to shame with the well-balanced flavors and the bowl chokeful of mushroom and fungus. Continuing the mushroom theme, I ordered the Crispy Black Mushroom on one occasion. 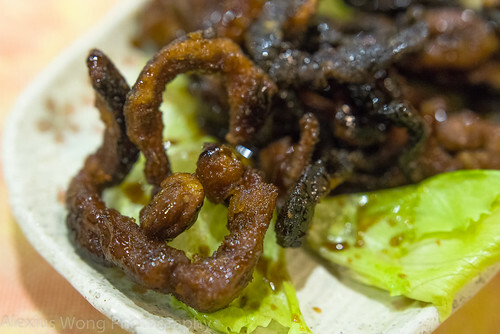 Pieces of dark sinuous pieces arrived on some lettuce with a hint of a sticky sauce. Biting into them, the slightly crispy batter gave way to pieces of rather thick and chewy mushroom strands. I was truly amazed at the texture that was quite “meaty” and the flavors of the forest since I’m fond of these fungi, and I can never get enough of their flavors. The batter was made from rice batter, evidenced by the firm texture and slight bouncy give. The dark sweet sauce had hints of sugar, vinegar, and orange peel that made these pieces irresistible. Never mind that they are deep-fried since they were not greasy and the flavors enticing. This is a must-order in my books. 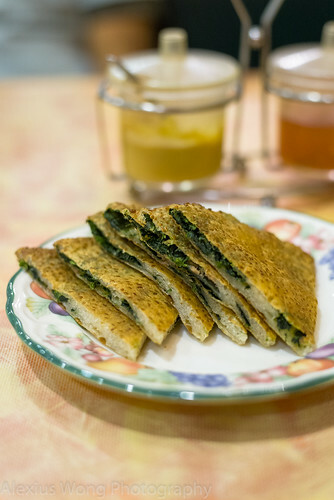 An appetizer on another occasion was Sesame Spinach Pancake. Triangles of pan-fried dough arrived with a deep green spinach stuffing peaking through. The outer layer was crispy tasting fragrant from whole sesame seeds toasted by the hot oil and slightly bouncy from the rice flour, much like Chinese sesame doughnuts I grew up on. The spinach filling tasted fresh and wholesome, but it was devoid of any salt which made them a bit underwhelming. But with the help of some condiments, Chinese mustard and sweet sauce, my interest was perked up with the sinus-clearing mustard and the sugar in the red sauce. Not exactly the most flavorful bite, but I appreciated the healthy elements in this pancake. Still within the realm of dough and spinach, I ordered Tan Tan Noodles on one night. 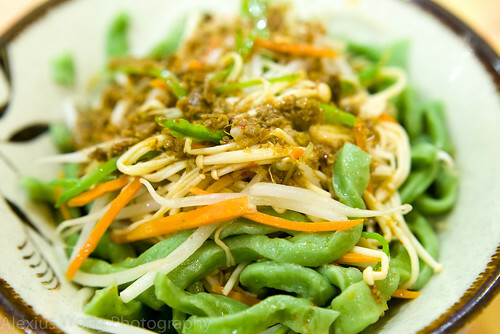 A bowlful of green noodles arrived topped with carrots, beansprouts, Inochi mushrooms, snowpeas, and shredded carrots. The star in the dish is definitely the noodles which were thick as udon, stained with spinach and cooked al dente, which made these dough strings slightly chewy and healthy tasting. The flavoring to the whole mix comprised of bits of salted radish and chili flakes that added the necessary saltiness and heat to each slurp. In addition, a small pool of broth at the bottom added the moisture and more savoriness to the mix. Not quite comparable to the real version that is heavily flavored with chili oil and seasoned chopped meat, I was yearning for a bit more flavor. But I appreciated this much healthier version as well as that bright green noodles whose every strand was worth slurping . I was curious how the house would stand up to a Chinese classic – Pan-fried Dumplings. Four dumplings arrived with one side pan-fried and the rest steamed, signs of being cooked the proper way. One bite into the first bundle pointed my tongue in the right direction. 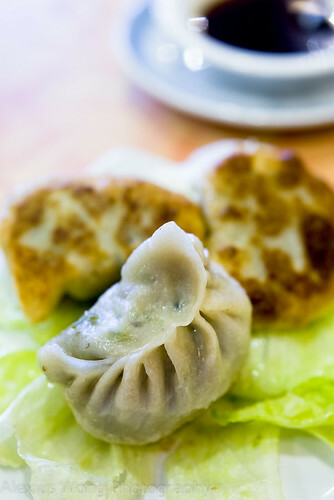 The skin was thin and slightly elastic, encasing a stuffing of chopped Napa cabbage, bits of mushrooms, a good dose of ginger that added a fresh zing to the slightly dark flavors of the filling partners. The dipping sauce had notes of oakey black vinegar and chili oil that took these little parcels to another level, and I could have eaten the whole order easily before my main course – but I had to refrain from indulging in these wonderful bite-size packets. The last dish that I savored from the appetizer section was Veggie Duck and Cilantro Rolls. 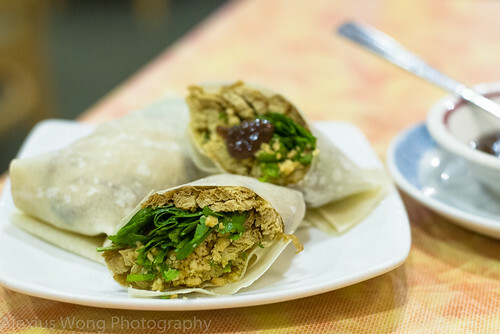 Two halves of a wheat wrap arrived stuffed with mock duck, lettuce, cilantro leaves, and crushed peanuts. One bite into them revealed a rather firm but fresh wheat pancake, reminding me of the ones used for Peking Duck. The “meat” was made with pressed soy sheets and it was rather soft and moist, much like fowl meat, and exuding notes of dusky spices. The greens and herb were vibrant and they added the fresh notes to the meat, along with the fresh-tasting crushed peanuts that added some rich nuttiness to the whole mix. The sweet plum and Hoisin sauce was the perfect accompaniment with its sweet and sour notes. Although these bites were rather filling, it did not take much time to finish them off before the other courses due to the fresh and satisfying flavors and textures. For the mains, one of the first dishes that I tried years ago, and is one of my favorites, is Veggie Duck with Basil and Ginger. A hot metal pot arrived boiling with a mound of brownness topped with some fragrant fresh basil. Pieces of “duck” (pressed soy sheets) are paired with button mushroom, fresh Shiitake mushroom, dried ginger, and mock smoked ham. 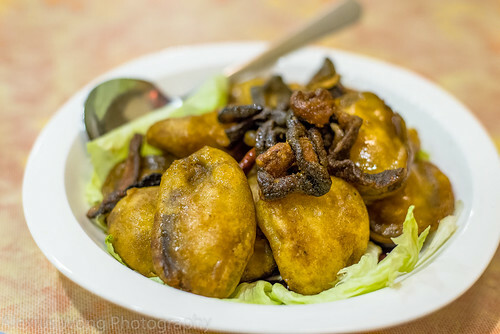 This dish was a hit with me and friend from the first bite with the fragrant 5-spiced infused “poultry”, the depth of flavor from the dried ginger, the firm texture of the fungi, and the “meaty” smokiness from the “ham”. It was the gestalt effect of these elements that brought a lot of satisfaction to this diner and made this hot bowl totally irresistible for me. Not only is it a popular Chef’s Special but a must-order in my books. Another dish on one night was Three Kinds of Crispy. The platter arrived with a mound of brown pieces that were not easily discernible at first sight. I started off with the dark strands sitting on top, and immediately I recognized it as the Crispy Black Mushroom appetizer that I was fond off – one down. The second bite was one of the battered rounds. The crispy and fairly exterior gave way to the silkiest and mildest eggplant piece that impressed me right away. Underneath this layer, I found pieces of battered mock chicken that mocked me for its meat-like texture and poultry-like flavor – three down. What brought these disparate elements together is the similar sweet dark sauce found in the mushroom appetizer that tantalized the taste buds with the fragrance of dried orange peel and heat from whole dried chilies. 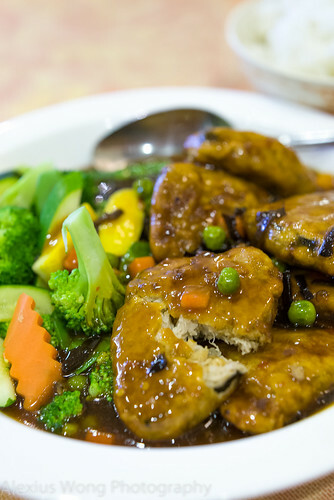 This is definitely a vegetarian version of the ubiquitious Orange Chicken, but tasting supped up with the chewy mushroom and melt-in-the-mouth eggplant pieces which kept me marveling at each bite. The batter got to be a bit filling, making the side rice bowl a bit redundant in the fill-the-stomach category. Another fried battered dish that caught my attention one night was Crispy Hunan Fish Fillet. The colorful plate comprised of large pieces of “fish” and some parboiled fresh vegetables on the side. The “fish” pieces had a soft texture and appearance of crab meat, while the seaweed wrapping imparting a scent of the sea. I found the protein pieces a bit stodgy due to a thin piece of taro root used to hold the “fish” together, but by removing it, it didn’t taste as “heavy”. The vegetables were perfectly cooked as well as the pieces of pea and carrot on top of the fish. But no Hunan dish is really veritable if were not for its sauce. Here, we have a perfectly executed one with the right amount of vinegar, sugar, chili heat, salt, and spicy bean paste – the proper elements to make the right Hunan sauce. I would order this again just for that well-executed sauce that made this dish sing. 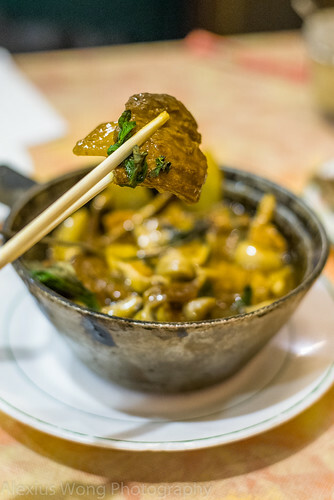 Another Chef’s Special was the last dish I savored on my trips there – Chow San Shein. The plate arrived glowing bright with colorful pieces of sweet pepper, broccoli, snowpeas, yellow squash, and three types of main elements. The smoked “ham” like in the Veggie Duck dish was present, exuding its savory smokiness and having a meat-like bite. The oval bites of “baby abalone” had a slightly firm texture reminding me of fish cakes and tasting of seafood notes. But it was the “carved and curved” Shiitake mushroom that screamed for my gastronomic attention. These pieces were slighty “meaty” in texture, reminding me of the consistency of squid, and replete with its forest goodness that made me look for more of it among all the other goodness. 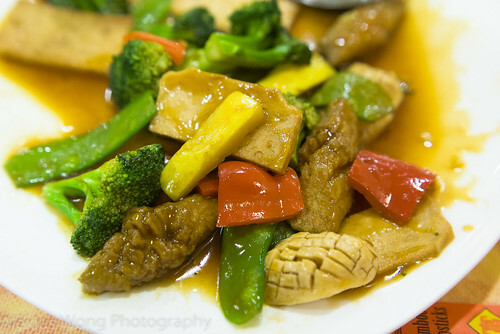 The brown sauce, probably vegetarian oyster sauce, was the right balance of flavors that brought all the elements together without being gloopy or overwhelming the integrity of each ingredient including the fresh-tasting perfectly cooked vegetables. I must say I couldn’t get enough of this flavorful and healthy looking dish and I’m looking forward to another order of this dish. Finally, I have found a vegetarian restaurant that not only serves dishes that are well-executed and properly seasoned, but they are inventive enough to keep me wanting to try more of its offerings despite the lack of animal protein. At times, I could not believe that I was enjoying them as much as I did, with the wonderful perfectly balanced Hot and Sour Soup, the crispy “meaty” bites in the Crispy Black Mushroom, the al dente spinach-colored Tan Tan Noodles, the gingery and savory Dumplings, and the flavorful and equally tempting mains made with mock duck, seafood, ham and chicken. Putting aside the lack of meat and seafood protein, the kitchen here understands what it takes to serve exciting and flavorful dishes, pointing towards the history of vegetarian cuisine in the Far East as the result of practicing the Buddhist faith. 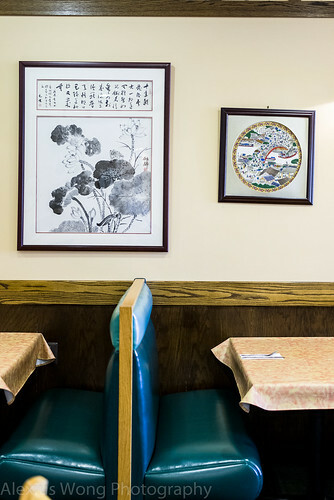 No wonder an article published yesterday named it the top Chinese restaurant in Maryland (read article) – maybe a slight hyperbole, but a quite fair estimation in my books.